Good fixturing is the difference between quickly and cleanly milling a design versus having a ton of chatter or causing your material to dislodge from the bed and go flying somewhere. Good fixturing allows you to use more aggressive feeds and speeds to achieve faster milling times, a nicer surface finish, and longer tool life. Good fixturing allows you to produce the same part multiple times with very little setup time. It’s the foundation (somewhat literally) of good machining and sets you up to efficiently innovate to your hearts content. In our robust support library, we offer a series of free guides dedicated to the main methods of fixturing. Read on to get an overview. 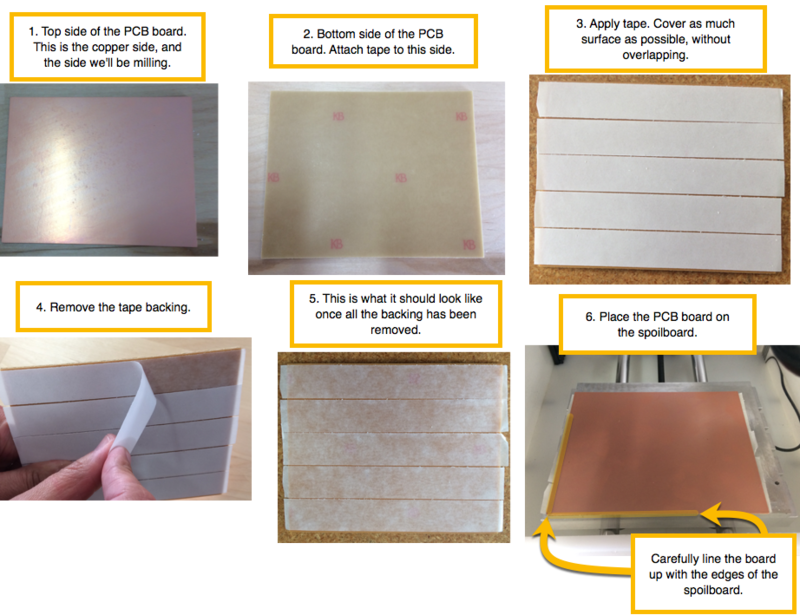 There are many ways to fixture your material with the Bantam Tools Desktop PCB Milling Machine, but they depend on what material you’re using, the type of job you’re doing, and your level of machining experience. Scotch double-sided tape, works for circuit boards that have larger features. It’s cheap, easy for anyone to use, and works for securing light, thin, relatively soft circuit boards to the bed. However, it’s not great for harder materials like metal because the machine has to use more force to push the tool into the material, and the tape isn’t strong enough to withstand it. Read the full guide for details. The Precision Fixturing and Toe Clamp Set provides rigid, consistent workholding without the use of tape or glue. It can be used to precisely locate the corner of your material, just like the thin alignment bracket that ships with every milling machine. 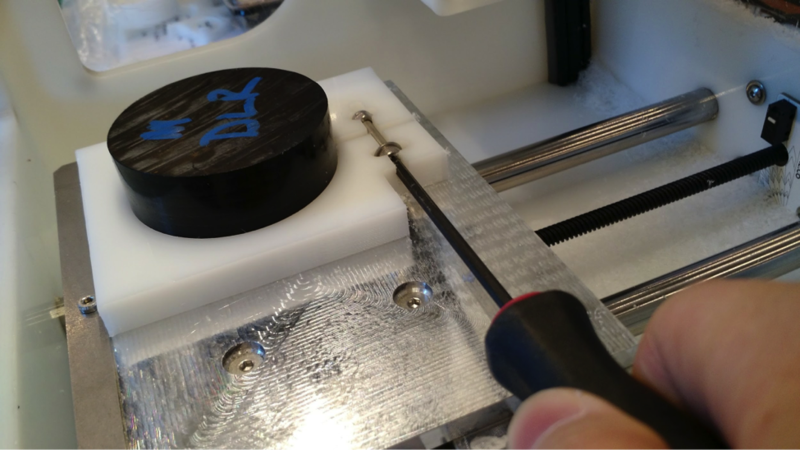 It works well with metal that's at least 1/8"(3 mm) thick and with softer materials that are 1/4" thick or more. Thinner stock tends to buckle and won’t stay flat under heavy clamping loads, so thicker stock is generally better. Read the full guide to learn more. Because bolts are much stronger and more rigid than other methods of attached the material to the machine bed, like tape, there's less vibration in the workpiece. Less vibration means you can mill faster, achieve greater precision and nicer surface finishes, and increase the life of your cutting tools. Pretty awesome! The trade-off is that it takes longer to set up and there are more steps involved. A custom fixture is generally comprised of a piece of material bolted to the bed, with a shape cut out of the middle to hold the object that will be milled. Many custom fixtures have locking mechanisms that can be tightened to secure the material being milled. 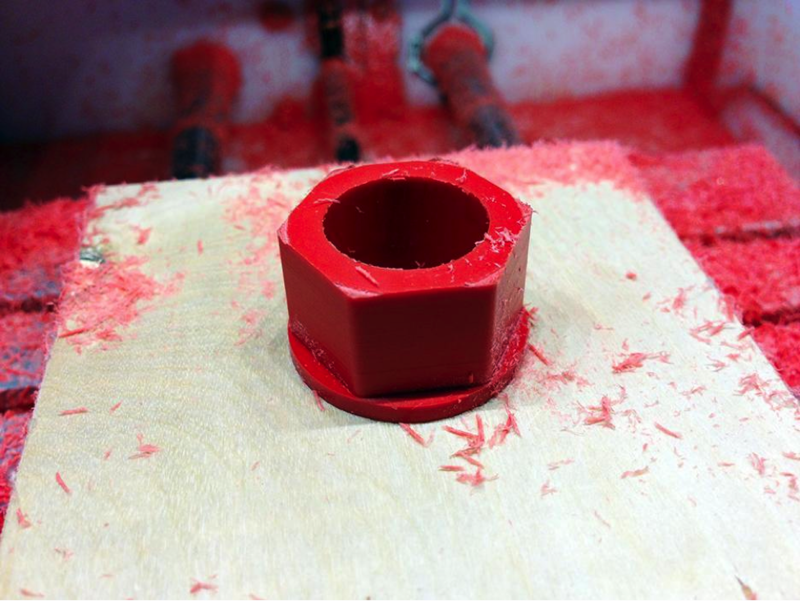 Here's a simple custom fixture consisting of a piece of wood with a hole in it for the red Delrin piece. 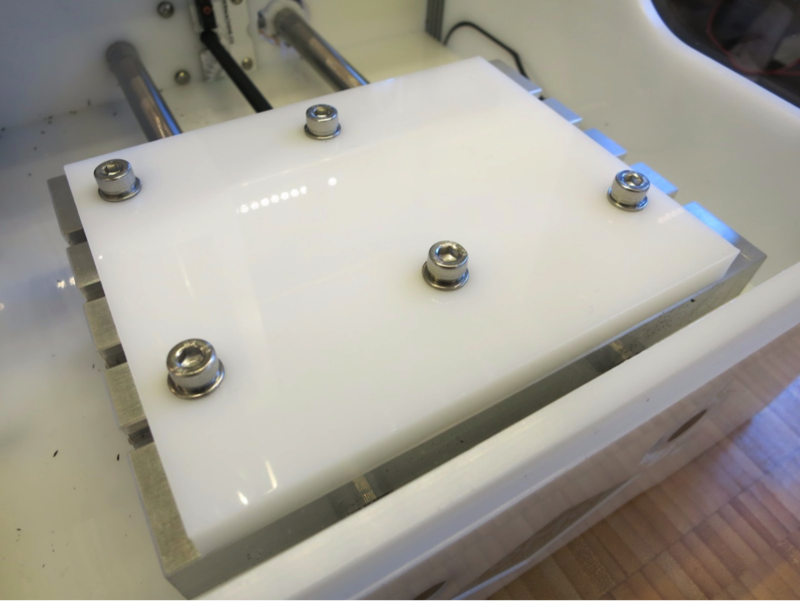 Interested in building custom fixtures for your milling machine? Our Dimensions and Diagrams guide contains precise dimensions, diagrams, and 3D models of the machine's work surfaces.